Trend Micro Titanium Maximum Security 2014 ($45 for one year of protection on up to three PCs) stands out for being an all-in-one security suite. It offers the usual antivirus and anti-malware protection, plus a mobile security component, 5GB of free online backup, and password and online-banking security. It also carries the same price as Trend Micro’s Internet Security 2014 suite at the moment, so fans of Trend Micro will find it well worth grabbing for all the extra features. In AV-Test’s real-world (zero-day) tests, Trend Micro successfully blocked 100 percent of unknown malware attacks, putting it on a par with Eset Smart Security, F-Secure Internet Security 2014, Kaspersky Internet Security 2014, and Norton Internet Security 2014. It also blocked 100 percent of known malware attacks, and it didn’t flag any safe files or websites as threats in our usability tests. Further good news: That excellent level of vigilance has relatively little impact on performance. In AV-Test’s performance tests, Trend Micro earned a mark of 5, so it will slow your system somewhat but not too excessively. Trend Micro Titanium Maximum Security 2014 offers outstanding security, but its interface needs to step into the touchscreen era. Prior to installing the program, Trend Micro will scan your system and ask you to uninstall any other antivirus programs (including trial versions) you may have; you can perform this step directly from Trend Micro’s installer. Though uninstall routines may require a reboot, simply installing Trend Micro won’t. The rest of the process is simple, with just a couple of screens to click through. Trend Micro’s main screen is relatively easy to read. Along the top of the main console window are five large tabs: Overview, PC/Mobile, Privacy, Data, and Family. The first tab features a large checkmark to indicate that your system is protected, as well as information such as a ‘Security Summary’ (which keeps a running count of how many threats the suite has stopped) and a button for scanning your system. One potential source of confusion is the fact that a selected tab is tinted red; in many other security suites, that hue signals “danger,” but it appears here as Trend Micro’s brand color. The other tabs offer additional features, including ‘System Tuner’ and ‘Rescue Disk’ in PC/Mobile, ‘Social Networking Protection’ in Privacy, and parental controls in ‘Family’. You can access the suite’s settings from the main tab, just below the large green checkmark, next to the scan button. Trend Micro’s interface is heavy on check boxes and radio buttons rather than touchscreen-friendly toggles and tiles, and explanations are sparse. The seemingly redundant Other Settings menu within the settings menu offers a hodgepodge of advanced and not-so-advanced settings. Of the four suites we tested that delivered very strong antimalware performance and that offer coverage of up to three PCs for one year, Trend Micro’s had the lowest price: $45, versus $80 for Norton, $60 for Kaspersky, and $56 for McAfee Internet Security 2014. If you’re willing to overlook the interface’s shortcomings, Trend Micro Titanium Maximum offers outstanding protection and a lot of features for the money. 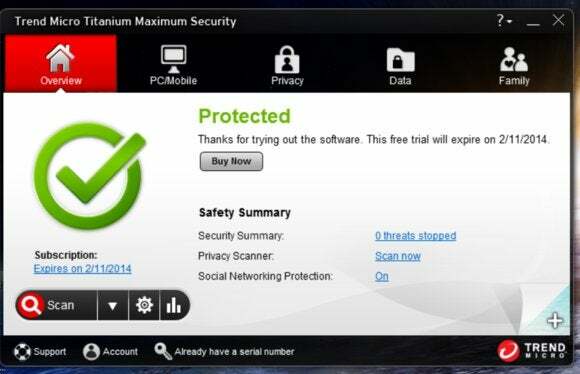 TrendMicro's suite offers robust protection and a lot of extra features for the money.